Revealed during today's Nintendo Summit in San Francisco, the Wii version of Ubisoft's Prince of Persia: The Forgotten Sands comes complete with cooperative multiplayer and a playable version of 1992's Prince of Persia for the Super Nintendo. We knew the Wii version of Prince of Persia: The Forgotten Sands would be different, but we didn't know it would be THIS different. According to Nintendo, the Wii version features co-op multiplayer, a feature not mentioned in any of Ubisoft's materials released so far. We should have more details on how the co-op feature works later on today. Update: An updated Ubisoft fact sheet lists details the co-op mode thusly: "Team up with a friend who can manipulate traps, slow down enemies, uncover hidden secrets, and utilize powers in the first true co-op experience being introduced into the Prince of Persia universe." 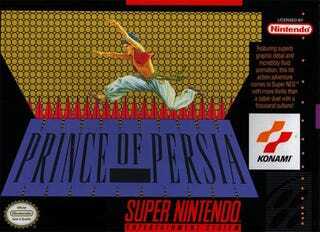 Along with the co-op multiplayer comes an on-disc version of 1992's classic Prince of Persia for the Super Nintendo, perhaps one of the best versions of the original game every made. Judge for yourself when Prince of Persia: The Forgotten Sands hits the Nintendo Wii on May 18th.